‘Mickey’s Good Deed’ is the second of four Mickey Mouse Christmas cartoons (‘Mickey’s Orphans‘ from 1931 was the first, the third would only appear at the end of Mickey’s career in 1952: ‘Pluto’s Christmas Tree‘ and the fourth would herald Mickey’s return to the screen in ‘Mickey’s Christmas Carol‘ from 1983). ‘Mickey’s Good Deed’ is a typical cartoon of the Great Depression era, which, if we look at the Hollywood output, seemed to find its lowest point in 1931-1933. Surprisingly many films from these years show people in great poverty, struggling at the bottom of society. Other examples are the Laurel and Hardy short ‘One Good Turn’ (1931), the Flip the Frog cartoon ‘What A Life’ (1932), the Cubby the Bear cartoon ‘Barking Dogs’, and the Warner Bros. musical ‘ Gold Diggers of 1933’ (1933). In the opening scene of ‘Mickey’s Good Deed’ we watch Mickey being down at the dumps: he is a poor street musician, playing ‘O Come, All Ye Faithful’ on a double bass in the snow. He’s obviously homeless and his pants are ragged. When all the change he got turns out to be just bolts and nuts his hopes of a decent meal in a fancy restaurant are shattered. Meanwhile a rich and spoiled brat discovers Pluto and wants him for a present. So his father sends out his servant to buy Pluto from Mickey. Mickey first refuses, stating that Pluto is his pal. But then his double bass is destroyed by a sleigh and Mickey discovers a very poor and desperate mother of numerous kittens. In other to help the latter, he finally sells Pluto to buy numerous toys for the little kittens, which he gives them, dressed like Santa, while they’re sleeping. Meanwhile, the spoiled brat is giving Pluto, his own father and the servant a hard time. In the end, the father spanks his son and throws Pluto out of the house. The cartoon ends when Mickey and Pluto are rejoined again, sharing a roasted chicken Pluto accidentally had brought along. ‘Mickey’s Good Deed’ is one of Mickey’s most melodramatic cartoons, and relatively low on gags, the most of which involving the spoiled brat and his antics. It plays a familiar theme contrasting the spoiled rich, who think they can get anything with money, with the unfortunate poor, who are willing to help each other out. It’s strange to see Mickey so poor, however, as he is in this cartoon. It’s as if he had lost Minnie and his friends, as well. The most poignant scene is that of a homeless Mickey roasting a sausage on a fire with a mock Pluto made out of snow. This cartoon contains a caricature of Jimmy Durante as a jack-in-the-box, which is probably the first of many caricatures of this 1930s comedian in animated film. One and a half year later, Mickey would meet Jimmy Durante in person in the live action movie ‘Hollywood Party’. ‘Barking Dogs’ is one of those 1930’s cartoons with a clear Great Depression theme. 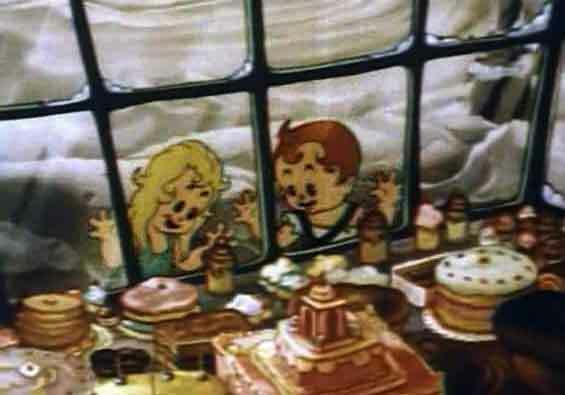 The short opens with Honey worrying as she will be displaced because she didn’t pay her mortgage (a story idea anticipating Disney’s ‘Moving Day‘ by three years). Cubby comes along, and offers her to help. His help is hardly convincing, as he immediately runs off in a feeble attempt to pawn his pocket knife. Meanwhile, the evil land owner, A. Wolf, comes along to take all Honey’s furniture away, and incidentally, her house, too. Meanwhile, two metal dogs (?!) warn Cubby who returns to the scene, finding Honey crying on the doorstep. “It’s too late” she sobs, at which he replies “Nothing is too late for Cubby!”, and together they ride the two metal dogs to A. Wolf’s house. Strangely, it’s the two dogs who fight and dispose of the evil land owner, leaving Cubby as a completely idle bystander. The complete cartoon makes little sense and is difficult to enjoy as none of the animation is interesting or any of the gags funny. But once again, Gene Rodemich’s score is delightful and on a complete different level than all other aspects of the cartoon. The two metal dogs are elegantly designed and much more appealing than Cubby and his girlfriend.